Our seamless rotationally moulded containers mean unlike blow moulding, there are no welds and have uniform wall thickness. All this means they're suitable for the most extreme uses. A REUSABLE IBC SYSTEM: MORE EFFICIENT AND SUSTAINABLE THAN RECYCLING. Find out how our reusable IBC system beats recycled packaging on environmental and financial grounds. HERE TO HELP WITH YOUR MATERIAL HANDLING PROBLEMS. We're more than just manufacturers. Decades of experience means we can help design systems to make your processes more efficient. 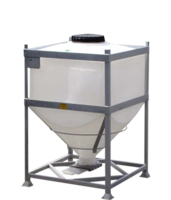 UN approved multi trip intermediate bulk containers for hazardous applications. Multi trip intermediate bulk containers for general purpose applications. 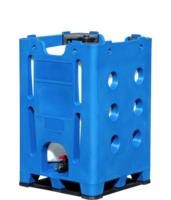 Francis Ward are the only UK manufacturer with a complete range of industrial packaging specifically designed for Reuse. 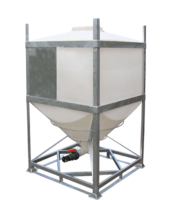 Our range of high specification Intermediate Bulk Containers (IBCs) and drums in Polyethylene Plastic, Mild Steel and Stainless Steel are second to none. Every container we produce will give years of safe and reliable performance in tough demanding industrial environments such as chemicals, off-shore and intensive food manufacturing. We have proved this with our customers in the chemical transportation, food manufacturing, brewing, dairy, pharmaceutical, cosmetics production, oilfield, and catalyst industries, and we were the first packaging company to be voted 'Supplier of the Year' by the CBA. Francis Ward manufactures reusable intermediate bulk containers (IBCs) and plastic drums for the storage and transport of hazardous and non hazardous liquids and solids.